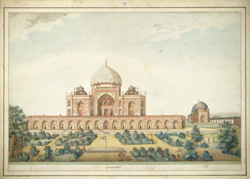 Watercolour of the Mausoleum of Humayun and its compound in Delhi, by an anonymous artist working in the Agra style, c. 1820-1822. Inscribed on the front in English: 'Tomb of Hoomauyoon Bad Shah';' Tomb of Koaka'; in Persian characters: 'Maqbarah i Kokah - Maqbarah i Humayun badshah i ghazi' (Tomb of Kokah - tomb of the Emperor Humayun). The tomb of Emperor Humayun, built in 1565, was commissioned by his wife Haji Begum. It was the first garden-tomb on the Indian subcontinent and is architecturally important because its plan and form were precursors to those of the Taj Mahal. The mausoleum, built of red sandstone trimmed with marble, sits on a high plinth and is crowned by an imposing white marble dome. This drawing is one of the first by a Delhi artist to depict a landscape; trees, bushes and figures have been added in the foreground.